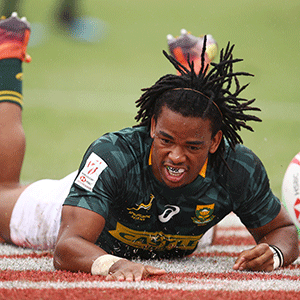 Cape Town - The Springbok Sevens team secured convincing wins over Scotland, Canada and Fiji to finish top of their pool on the first day of the Singapore Sevens on Saturday and will face Samoa in the Cup quarter-finals on Sunday. "We realised Fiji would be desperate after their earlier loss to Scotland, but we countered them well, with the young guys showing a lot of energy," Dazel explained. "We learned from that and will make sure we arrive with the right mind set and skill set to beat Samoa," said Dazel. "Our guys need to recover well though, as we were the last two teams to play and there is a short turn-around." He predicted a physical encounter against Samoa: "They are playing very well over the last couple of months and are very consistent. We beat them last weekend, but they change their game plan around, so we need to be ready. "We have to focus on what we need to do and if we manage that, we can get the result," Dazel said.